On websites you will often find a link to a privacy statement. Does your congregation have one? Visit Joseph Priestly District’s growth resource page. With permission I share this comment by Rev. Marlin Lavanhar on the national response to his recent sermon on the shooting of Trayvon Martin and the book The New Jim Crow: Mass Incarceration in the Era of Colorblindness. I hope you’ll watch and share both Marlin’s sermon (below) and Alexander’s book. For more information on the book see www.newjimcrow.com. Order via Amazon and Amazon Kindle. On Thursday, April 5, at 7 pm, Rev. Dr. Bill Schulz will be speaking at the Melrose UU Church, 70 West Emerson St., Melrose, on “The Future of Human Rights.” He is the current President and CEO of the UU Service Committee, and past President of Amnesty International. Former President of the Unitarian Universalist Association, he is a long time advocate for human rights and has traveled to many places around the world to work for justice. Anyone who has heard him speak before will tell you – he is an excellent speaker and eminently qualified to speak on this important topic. The church is accessible via the commuter rail, Cedar Park stop. Fair Trade refreshments will be served at the event. For questions, please call Donna Clifford at 781-483-3133 or the church office at 781-665-7504. William F. Schulz is the President and CEO of UUSC, the Unitarian Universalist Service Committee, a nonsectarian organization that advances human rights and social justice in the United States and around the world. Previously, he served for 12 years as executive director of Amnesty International USA, until spring of 2006. An ordained Unitarian Universalist minister, Schulz is a former president of the Unitarian Universalist Association. He has appeared frequently on radio and television news and analysis shows and is the author or contributing editor of several books, including In Our Own Best Interest: How Defending Human Rights Benefits Us All; Tainted Legacy: 9/11 and the Ruin of Human Rights; The Phenomenon of Torture; and The Future of Human Rights: US Policy for a New Era. Registration for the Ballou Channing District Spring Conference is now open! I can’t wait for this event as it will feature a keynote by the Rev. Ron Robinson who is doing amazing work in Turley, OK with a missional approach to Unitarian Universalist ministry. This missional approach marks one end of what we’ve been discussing online as a growing “bandwidth” of what church can be. There are a lot of ways we can go about being congregations and Robinson’s way is at one end of the spectrum. I can’t wait to meet Ron in person and learn from his truly innovative ministry. But don’t all come to my conversation – we have five of them! Whether you attend my program or not, all Unitarian Universalists are encouraged to read, discuss, and share the the Congregations and Beyond paper. You may visit my Congregations and Beyond page to read it, find related articles, and online forums for discussing. I also have a range of related sermons and workshops I’m developing for next year. If you want to book an event or guest speaking date for Fall 2012, I recommend contacting me by the end of April. Look forward to seeing you on May 5th! Saturday, May 5, 2012 8:30 a.m. – 2:30 p.m.
“A passion for a mission can transformed people and can transform the world. Being a mission-driven congregation gives meaning to a congregation and can by a means for outreach and a way to for a congregation to make a real difference in their community. This conference will explore various aspects of being a mission-driven congregation from working with the economically disadvantaged in a community to determining one’s own spiritual outlook to be the foundation for justice work. Rev. 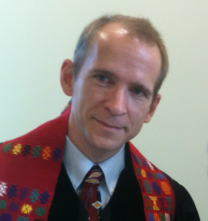 Robinson is the Executive Director of A Third Place Community Foundation, a non-profit formed by The Welcome Table, a missional, emerging congregation in the UUA located in Turley, OK. He is also the Executive Director of the UU Christian Fellowship and adjunct faculty of Phillips Theological Seminary in Tulsa, OK. He has served on the board of the Southwestern UU Conference and is a recipient of the Von Stilli Award for his work in helping churches grow. The afternoon will have four Conversations to further explore the theme by looking at various aspects of becoming mission-focused. There will also be an opportunity to engage in a Gathered Here exercise. Scroll down for full write up of each. The BCD Annual Meeting will be held in the morning at 9:15 as part of the worship service. What if our congregations actually encouraged people to explore the very topics that seem too hot to handle? The Rev. Amy Freedman, who helped members of a congregation she served to openly discuss several controversial topics during her tenure will offer three strategies for encouraging robust engagement with controversial subjects. Facing controversial issues, including what kind of mission a congregation should have is important for a congregation to be healthy. Creating one’s spiritual autobiography can deepen individual spiritual journeys to provide a foundation for doing missional work in a community while also fostering a richer experience among participants in our congregations. Rev. Ken Read-Brown, has led spiritual autobiography groups several times during his twenty-five years as minister of First Parish in Hingham (Old Ship Church). UUA President Peter Morales’ recent white paper, “Congregations and Beyond” offers a vision of the opportunities and challenges that face Unitarian Universalism if we are willing to push beyond pre-determined boundaries. 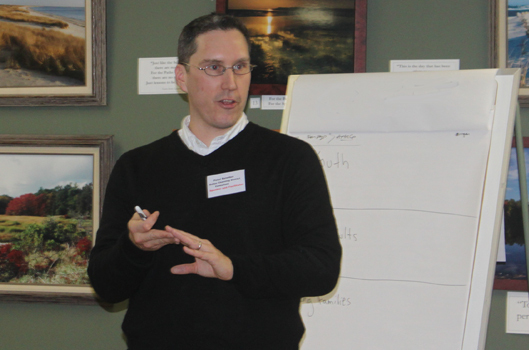 Senior UUA staff recently has been in conversation with congregation and district leaders, including BCD Growth Consultant Peter Bowden (read more). Building on these conversations he will facilitate a discussion about this important topic and its impact on congregational mission. Gathered Here is a UUA initiative using an appreciate inquiry model to let UUs share their experiences with and aspirations for Unitarian Universalism. The UUA Board and staff and District leaders will use the information assembled from these conversations taking place across the country to determine future course of the Association. * UU Network Mall: An assembly of informational displays and items for sale, Vendors, congregations, and organizations that wish to have a display should call the BCD office (508) 599-6650 to reserve a space. * Thank You! Your BCD Congregation Contributions helps provide staff support for the Conference. My colleague and friend, the Rev. Judith Campbell, has just released the third book in her “Mission Mystery” series! Judy is a Unitarian Universalist community minister and Ministerial Search Representative for the Ballou Channing District. She leads workshops and retreats in writing as prayer and spiritual practice across the US and in the UK. Learn more on her website. Introducing A Despicable Mission! Featuring UU minister inspired character Olympia Brown and set on Martha’s Vineyard. Ask for it at Local Bookstores and Libraries. It’s summer on the picture book island of Martha’s Vineyard. Olympia Brown is the summer minister, and she suspects that an elderly parishioner is the target of a nasty confidence operation. Much to the consternation of her colleague, Father Jim, and Frederick, her English gentleman, Olympia puts her own life in danger when she intervenes. Sparks fly, tempers flare, and Olympia ends up on the wrong side of a loaded gun. If you don’t already know the Olympia Brown series, check out A Deadly Mission and An Unspeakable Mission on our Books page. Already a fan? You’ll love A Despicable Mission, Olympia Brown’s latest adventure, also available in e-book formats for the Kindle and Nook readers. First, thanks to Peter Bowden for the invite to guest-post on UUGROWTH.COM. This is a great website! My name is Josh Pawelek. I’ve served as the parish minister at the Unitarian Universalist Society: East in Manchester, CT since the summer of 2003. Peter was curious about a recent opportunity I had to preach at Middle Collegiate Church in New York City’s East Village. Middle’s senior minister, the Rev. Jacqui Lewis has become a familiar face to many UUs in recent years as a popular workshop leader at the UUA General Assembly. UUs have also been attending Middle’s Leading Edge conference for a number of years. Among her many skills as a pastor, Rev. Lewis knows how to build multiracial, multicultural congregations. Middle is an old and historically white congregation going back to the Dutch Reformed settlers who founded Manhattan. Yet, through concerted and very intentional effort over the last thirty years, Middle has grown into a wonderfully diverse spiritual community and a leading voice in a variety of faith-based social justice movements in the city and state-wide. In this sermon we both tell a bit of our own stories in relationship to US racism. We reflect on current events. And we offer a hopeful vision and call to action. It’s a simple structure, but hopefully a compelling one. Certainly UUs have been wrestling with race and racism in a very intentional way since the 1992 General Assembly Resolution on racial and cultural diversity. But, just like the nation, we have many miles to go. A dialogue sermon on race and racism is simply one tool we have available to us in our efforts to build antiracist, multicultural congregational identity. Having said that, sermons on race and racism are, in the end, not what has shaped Middle Collegiate into the congregation it is today. In short, Middle made multicultural arts central to its worship celebrations. (The term “service” is off limits at Middle: every worship is a CELEBRATION!) Amazing music, visual arts, dance, poetry and puppetry from a wide variety of cultural traditions are what transformed Middle’s worship into a weekly CELEBRATION. On the evening of February 12th, the featured artist was Tituss Burgess. I confess I didn’t know who he was before I arrived. It turns out he is a Broadway star and a cast member on 30 Rock. If I didn’t understand before what Jacqui Lewis meant by celebration, I ‘got it’ once I heard Tituss sing! What can our UU congregations learn from this? Of course, it’s rare to have a star like Tituss Burgess in your congregation. And most congregations don’t have the kind of talent that Middle’s membership has, or the budgets to bring in that kind of talent on a regular basis. But it is also true that in so many communities in the United States, especially urban communities, there is a wide range of talent and a great diversity of artists from many cultural backgrounds. And most artists don’t operate in a social vacuum. Most artists participate in arts organizations, and many such organizations have unique cultural and/or multicultural identities. Why couldn’t a congregation partner with a multicultural arts organization? We are only at the beginning of building our relationship with Charter Oak, but so far so good. It is helping us to think in new ways about what it means to build an antiracist, multicultural congregational identity. It is helping us to realize there is so much more we can do than the traditional antiracism workshops, sermons on white privilege and educational movie nights, as important as those are. Middle Collegiate Church is a shining example of how a congregation can be transformed through multicultural arts. There’s no reason to think we can’t experience such transformation if we continue with purpose and vision down this new path. This post was published in 2012, a long time in terms of social media! The social media and other policies of the UU Congregation of Atlanta continue to evolve. Get the latest on the UUACA policy page. The work of UUCA is guided by a comprehensive set of executive policies and procedures, organized into seven functional categories. Click the links below to view a copy of the current policy and/or procedure. Friends, the following is the social media policy and protocols developed for the UU Congregation of Atlanta. As we learn to integrate social media and other communication tools into our ministry, having clear policies is very important. On the flip side, we can’t wait to have every detail and policy figured out before we start. Things are changing and evolving so rapidly, you really have to start moving and adapt and refine as you go. Best way to start? See what others are doing! I will be posting policy statements and other samples as they are shared with me. If you have material to share, please email me including your name, website, and how to credit the file. Special thanks to Tim and the UUCA team for their pioneering social media work! Read in full below or Download as Word Document. Social Media Policies and Protocols for the UUCA Social Media Team, www.uuca.org. This policy developed by Tim Atkins, Volunteer Social Media Coordinator, Rev. Marti Keller, and UUCA Staff Team. Shared with UUGrowth.com by permission. The Unitarian Universalist Congregation of Atlanta is a community of faith that encourages and supports our individual spiritual quests out of which we act together for social justice. Community. We value the friendship, love, and caring that we find in our congregation. We value the varied parts of our community—our children, youth, young adults, not so young adults, and the adults who are gracefully growing old within our midst. Diversity. We believe in and value the inherent worth and dignity of all people. We believe in this even when we are in conflict with people and value the conflict resolution process for the opportunities it provides us to learn. We value people across all racial, ethnic, and religious categories. Spiritual growth and development. We value an intellectually rich spiritual environment that transforms people’s lives. We value all the performing and graphic arts as they are represented in our worship and throughout our building. We value our rituals and traditions, across the life cycle from birth to death. We value experiences for our children and youth that promote their healthy development and dissemination of our socially and religiously liberal values. Social justice. We are a people moved to put our faith into action. We value our congregation’s history of involvement in social justice and community activism, and we value our status as “a force to be reckoned with” for liberal activism and justice in the wider world. Involvement and participation. We value generosity and opportunities to share our time, talents, and money to sustain our community and extend our reach into the world. A vibrant faith community for spiritual seekers that worship together, embracing lifelong religious learning and respecting different spiritual journeys. A loving community that provides support and care for others through both the best and the most difficult of times. A safe and welcoming community where all are valued. Children and youth, centered in the values of our religious community and nurtured in love, who are compassionate leaders in seeking justice and peace. People with a passion for social and economic justice who work together for human rights and a sustainable environment. A creative community that challenges us to see the world with new perspectives and gives voice to the human spirit through music and the Arts. We are a place where hope is born – Hope that we as a congregation, nation, and world can live harmoniously, with arms that can reach across great divides to offer support, find friendship, and make peace. We give these gifts to the world. This Covenant of Healthy Relationships affirms the foundation of our unity at UUCA. Our commitment to one another ensures that our community will be a safe and inspirational place in which we, as individuals and groups, can live out our spiritual journeys. Social media is often the first image our congregation presents to newcomers, questioners, and visitors. We must be mindful of how we present our congregation through these social media channels when posting/publishing under the UUCA name. All communication we send out must comply with the Covenant of Healthy Relationships and must comply with our Mission, Values, and/or Ends. These should always be on our mind as we communicate under the UUCA name: we aren’t speaking for ourselves; we’re speaking as the congregation. All communication must comply with the Covenant of Healthy Relationships, and we must lead by example. If there is a post from a congregant/visitor that you feel violates our Covenant of Healthy Relationships, bring it to the attention of one of the ministers. If they concurs it is a violation of the Covenant of Healthy Relationships, delete the comment/post in question and send a private message bringing attention to the Covenant of Health Relationships, and informing commenter that repeat offenses will lead to being banned. Stay away from posts dealing with Social Justice issues unless given approval or instruction by the minister with social justice in their portfolio, or unless it is initially posted by the UUA or Standing on the Side of Love campaign. When we post something as UUCA, it comes across at the official stance of the congregation. If we haven’t yet taken a stance on an issue that’s available on our congregation’s website, you need to get approval before posting. If any congregant posts something social justice related on our official communication tools, be clear that, “this represent the opinions of this individual, not the congregation,” and moderate them to make sure they are in accordance with our covenant of healthy relationships. No posts advertising private businesses or political candidates are allowed under any circumstances using official congregational accounts. Events/posts from partner nonprofits we have worked with in the past or further our mission/values/ends are acceptable unless those events/posts conflict with any policy in this document. Before any posting that has a picture or image of a child, we must have a parental waiver. If a child/youth from our congregation ever posts something that is alarming, implies abuse or suicidal thoughts, immediately bring attention of the post to the Director of Religious Education and Youth Programs Coordinator. All social media outlets need to be updated regularly, preferably daily, with relevant content. Content should look professional, be free from typos and grammatical mistakes. All words, pictures, videos, music, and any other media must either be the original work of the poster or copyright laws and appropriate attribution must be followed. Any changes made to themes/profile pictures/color schemes must be approved by the Social Media team and staff with communications portfolio. Formally recognized affinity groups within UUCA may request events posted on their behalf, with a maximum of a one time a week posting. Outreach/Connection to greater community and denomination. Regular posts must be made addressing each of the three areas, preferably at least one post a day. Unlike other social media platforms, if someone goes to the UUCA-Unitarian Universalist Congregation of Atlanta facebook page, they will see posts we have not directly approved. Other people can post to the facebook wall under their own names, although this does not show up in the facebook feed of our followers. Therefore, facebook is the main social media platform where we will need to moderate posts. Right now when anyone posts to the UUCA wall, an email is sent to administrators. Monitor these emails and posts on a daily basis – if something is posted that violates our Covenant of Health Communications, act immediately. Do not comment on other pages as UUCA. Leave comments as “UUCA – Unitarian Universalist Congregation of Atlanta” only on our page. Follow up comments must be relevant to the initial post/comment, provide accurate information, and have a calm, nonviolent tone. If there is a discussion that forms over a post, do not participate in or elevate any kind of argument under the “UUCA” name. Events from the weekly update, newsletter, and “Special Events” section of the website should be created on facebook as an Event under the UUCA name. No more than six facebook posts should be made on a single day unless there are extenuating circumstances. We don’t want to flood our fans’ newsfeeds. Do not edit the page or add any additional facebook applications to our page on your own without prior approval of the Social Media team. We have chosen to only like denomination-wide pages, district-wide pages, our interfaith partners, and affinity groups within our congregation. Be sure when liking a page from your personal facebook account that you don’t accidently like it from the UUCA page. As a congregation, you can like official UUA affiliates (right now the UUWF and UUSC) and other congregations that we have a current, clearly established partnership. Event announcements and inspirational quotes. Twitter is much more of a conversational medium and more instantaneous than facebook. Unlike facebook where a one-shot post approach works, twitter often involves multiple tweets back and forth with other tweeple. Therefore, more regular attention needs to be paid to twitter for follow up replies and direct messages. Anything we post on directly on facebook also shows up on our twitter account. Make use of a tweet scheduler program like Hootsuite or Tweetdeck to make sure tweets go out throughout the day rather than all at once. When using these services, be extra careful to post from @UUCA and not your personal account. If you do accidently post a personal tweet through UUCA’s name, delete it immediately. It’s both common and popular to post inspirational quotes. Make sure all quotes are attributed, and designate which of our six sources they come from. Make sure all twitter conversations are relevant to our Mission, Values, and Ends. Do not get pulled into heated theological arguments or political rhetoric. If a tweet asks for information you aren’t sure about, refer to our website publically or to the appropriate staff members in a Direct Message. Don’t follow everyone who follows us – a lot are spammers. Follow back other UU congregations and organizations, community organizations in our area, and members/friends of the congregation. Tumblr posts to our facebook wall – be careful with too many posts all in a row, or it floods the facebook wall. If there is something posted on tumblr that’s not quite appropriate for facebook (like answering someone’s question) pull up the facebook page and delete the tumblr post. Additionally, use tumblr as a tool to schedule posts to our facebook wall. Tag all of our posts on tumblr with Atlanta and Unitarian Universalism, among other relevant tags for the post. Feel free to like posts relevant to UUCA’s Mission, Values, and/or Ends. Liking posts is a way to get our name out there without it posting to our facebook wall. Likewise, reblogging posts relevant to UUCA’s Mission, Values, and/or Ends is fine, but each of these posts will show up in our tumblr feed and on our facebook wall, so use sparingly. Always like more posts than reblogging posts. Right now tumblr is the most likely platform where we will see teenagers expressing personal pain (much more so than facebook or twitter.) Remember that if you see anything alarming from one of the youth in our congregation, alert the DRE and the Youth Coordinator immediatley. If appropriate to youth outside our congregation, offer them links to resources with helpful information or consoling, hopeful words. If the tumblr account is clearly a youth under the age of 18, do not initiate following that person. You can only follow them back. Don’t post text-heavy items on tumblr. Avoid posting more than three paragraphs of text, or it’s unlikely to get read. Whenever possible, include a picture with the text. Make sure all pictures initially posted by UUCA are either in the public domain, a picture taken/created by you or another member in the congregation, or used according to its Creative Commons license. All pictures must be PG rated or under. Similar to twitter, don’t follow everyone who follows us without first checking to see if they’re a spammer. The prior week’s sermon is auto posted to the tumblr account. Remember with all tumblr posts to gear the posts, wording, language, etc. to a younger audience. A far majority of tumblr users are 15-25. Affinity Groups are welcome to start their own web-based communication tools, but as a congregation we do have some guidelines. Let the website team know if you start a website. Only officially recognized affinity groups will have a link to their site posted on the UUCA Website. You can use the UUCA logo on your site but cannot change it or modify it in any way without the written approval of the staff member with the communications portfolio. We want to actively prevent any misuse of our logo. We will retweet/reblog information when asked to from affinity groups on twitter or tumblr.